QUEZON CITY – Donning half masks of the faces of the leaders of the student protest movement in the early seventies known as the of First Quarter Storm who are now recognized as national heroes and martyrs, members of the Samahan ng Progresibong Kabataan (SPARK) gathered three days before the forty-fourth anniversary of the declaration of Martial Law by former president Ferdinand Marcos to honor and express gratitude to the heroes and martyrs who paid the ultimate sacrifice in the struggle for democracy and civil liberties at the Batayog ng mga Bayani Memorial in Quezon City. “By drawing inspiration from the generation of martyrs that led the toppling of the dictatorship, we are humbled by the stories of their lives, of their individual and collective sacrifices to which we owe them our present freedoms, said Joanne Lim spokesperson of the group. She added that, “Incidentally, after more than four decades since Marcos assumed absolute power and discarded all civil liberties, we are once again faced with a regime that is strikingly similar. Human rights violations are on the rise but more worrisome is that people seem to mistake it for progress”. They also called on the youth to take up the challenge of continuing where the heroes and martyrs of the FQS generation left off. “The challenge does not call for us to simply defend whatever rights and freedoms we currently enjoy but to broaden and take it further. We need more extensive political rights and civil participation in order to struggle against modern-day social conflicts such as state-sponsored violence, contractualization, and the ever-increasing disparity between the haves and have nots graft and corruption, and ecological justice,” Lim explained. SPARK likewise announced that they will add their voices to the clamor to stamp out all forms of contractualization as well as the abusive practices of on-the-job trainings of college students. “The youth must take a deeper look at the situation of the labor sector in the country because will all end up as employees and blue-collared workers once we graduate”. PALAWAN, Philippines – As SoundCloud focuses on major label music, Indie Artists worldwide look for a new service to call their own. On Radical Indie (http://www.radicalindie.com) musicians get FREE uncapped accounts and keep 100% of revenues from downloads, merchandise sales, and shows they promote. With 'Import from SoundCloud' they can easily upload whole collections. Radical Indie works on Chrome browsers; apps are available for iOS (https://itunes.apple.com/us/app/radicalfm/id666778251) and Android (https://play.google.com/store/apps/details?id=fm.radical). The most powerful LIVE audio broadcasting platform to ever offer legal music content, Radical allows anyone to share Independent music Live via one-touch 'BroadCast' for completely synchronous real-time sharing. While proprietary TALK™ technology allows every user to inject their voice into their BroadCast to host Live radio to an unlimited audience worldwide. Indie Artists can present new releases LIVE to their fans (sorry SoundCloud). TALKshow Hosts can conduct interviews or ramble to their heart's content (not iHeart's). Journalists can Host their own news programs on any topic they choose (screw FOX). Every User can do anything they could do with their very own radio station, FREE! "By allowing users to create live BroadCasts with personality and legal content, Radical Indie is catapulting old school radio into the internet age", says founder Thomas McAlevey. "Now listeners can chat directly with their favorite DJs, Kanye West can modify his playlist order based on real-time feedback, a pastor from Zimbabwe can build a global following for his sermons, or the kid next door can become the next Ryan Seacrest." Home to Independent Musicians and TALKshow Hosts worldwide, all-new Radical Indie is the most social streaming audio service ever. Philippine President Rodrigo Duterte marked his first participation in the 13th ASEAN Business and Investment Summit on 6 September 2016 in Vientiane, Lao PDR. 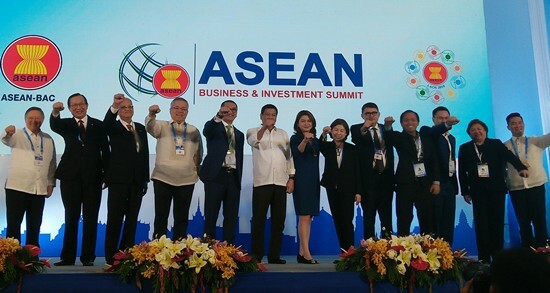 Joining him were DTI Secretary Ramon Lopez, Finance Secretary Carlos Dominguez III, the Philippine-ASEAN Business Advisory Council (PH-ABAC) led by incoming chairman Mr. Joey Concepcion, Ms. Tessie Sy-Coson and Mr. George T. Barcelon, and the Filipino Entrepreneur Awardees at the 2016 ASEAN Business Awards, led by Ms. Sherill Quintana of Oryspa. Lao PDR – Philippine President Rodrigo Duterte declared that the Philippines’ economic thrust for inclusive growth will focus on innovating micro, small and medium enterprises (MSME) development, e-commerce, youth and women entrepreneurship, as he served as one of the speakers in the 13th ASEAN Business and Investment Summit (ABIS) held on 6 September in Vientiane. The President believes that in order to be a global player, ASEAN must ensure the effective implementation of key economic agreements and the integration of existing sub-regional cooperation frameworks in ASEAN such as the Greater Mekong Subregion (GMS), the Indonesia-Malaysia-Thailand Growth Triangle (IMT-GT) and the Brunei-Indonesia-Malaysia-Philippines East ASEAN Growth Area (BIMP-EAGA). “Hailing from Mindanao, I commit to promote BIMP-EAGA. We intend to open up our other major islands like Mindanao and the Visayas with high quality backbone infrastructure,” he said, adding that the Philippines will accelerate infrastructure spending by improving national roads and bridges. The President, joined by key economic managers, Department of Trade and Industry (DTI) Secretary Ramon Lopez and Department of Finance (DOF) Secretary Carlos Dominguez III, called for ASEAN’s support for MSME development and expressed hope to further expand the Roll-On Roll-Off (RO-RO) facility to Davao-General Santos and Bitung in Indonesia. “We will work and collaborate with ASEAN in helping the MSMEs look for all ways to connect them in the countries of ASEAN and the world. We will work in advancing our policy and regulatory environment providing an affordable and innovative digital platforms, and accessing best practices and financial resources,” he said. ASEAN must engage the world in a “robust way” by maximizing Free Trade Areas (FTAs) with Australia and New Zealand, China, India, Japan, and Korea, according to him. He also announced that the Philippines will host the Regional Comprehensive Economic Partnership (RCEP) senior officials’ meeting in November 2016. Speaking before members of the ASEAN Business Advisory Council (ABAC), which gathers leading CEOs, heads of chambers and commerce and industry and business organizations from ASEAN Member States (AMS), the President emphasized that sensibly-crafted and well-implemented laws are imperative towards bringing good governance and order, as well as providing an enabling environment for the country’s progress and prosperity. “We should act together in concert to ensure that the economic gains we made so far will advance at full speed, so that ASEAN can confidently play its rightful role as a global player contributing to economic growth and prosperity,” he concluded. The ABIS is ASEAN’s premier annual business and investment event, which coincides with the 28th ASEAN Summit. Per organizers, ABIS is where the ASEAN private sector identifies, discusses and develops answers to pressing issues that impact the region’s investment attractiveness and business potential. ABIS 2016, carrying the theme “Operationalizing ASEAN Economic Community – Turning Vision into Reality,” aimed at charting new ideas, opportunities and insights to propel the business sector towards regional development. CAMP VICENTE LUKBAN, Catbalogan City – In adherence to the declaration of President Rodrigo Roa Duterte’s “State of National Emergency on Account of Lawless Violence”, the 8th Infantry Division and the Police Regional Office 8 is currently conducting joint AFP-PNP security patrols and checkpoints all throughout the Eastern Visayas to secure the people, vital facilities and infrastructures against the Abu Sayaff and other terrorist groups. 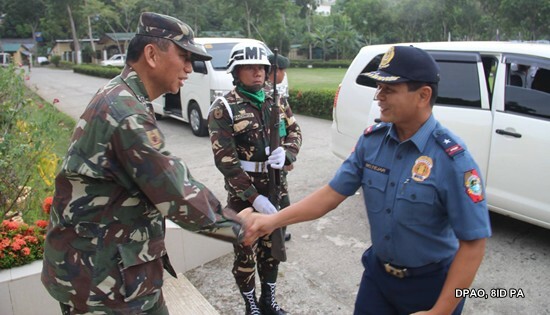 Upon the President’s declaration of “State of Lawlessness” on September 5, 2016, a coordinating conference was initiated by this Command headed by Maj Gen Jet B Velarmino AFP, Commander together with the PNP headed by Police Chief Superintendent Elmer C Beltejar, Acting Regional Director, PRO-8 and other Law Enforcement Agencies to come-up with measures to ensure the safety and well-being of the people of Eastern Visayas. With that, the body agreed on the need to enhance present security measures especially in public places such as bus terminals, airports, seaports, commercial centers and places of worship. Maj Gen Velarmino also added that the 8ID will deploy sufficient troops to augment the Philippine National Police in their foot and mobile visibility patrols, checkpoints and inspections. Likewise, troops and K9 bomb sniffing dogs will be augmented to the Philippine Coast Guard and CAAP/ATO in all seaports and airports in the AOR, respectively. With the aforesaid, we would like to appeal to the public for your utmost cooperation and understanding as we, your Army in Region 8 together with the Philippine National Police and other law enforcement agencies, will continue to do our mandate of protecting and serving the people of Eastern Visayas. PASAY CITY – The Senate is headed toward relaxing or repealing the country’s law on bank secrecy as a step to counter terrorism and corruption, according to Senator Chiz Escudero. The Senate Committee on Banks, Financial Institutions and Currencies, which Escudero chairs, heard today several legislative proposals to amend the bank secrecy law or Republic Act No. 1405. There have been talks of changing the bank secrecy law to allow authorities to probe highly suspicious bank accounts, especially after $81-million hacking of the Bangladesh account with the US Federal Reserve early this year that ended up in a Philippine bank. The Philippines and Lebanon are the only remaining countries with stringent laws on bank secrecy in the world, according to the Bangko Sentral ng Pilipinas Gov. Amando Tetangco, Jr.
RA 1405 prohibits disclosure of bank deposits, either held by public officials or private individuals, with any banking institution. Escudero, however, said that since some Senate proposals may exclude government officials, they will however compel public officials to submit a waiver in favor of the Ombudsman on the secrecy of their bank deposits, along with their sworn Statements of Assets, Liabilities and Net Worth (SALN). Such move is enclosed in Escudero’s proposed Senate Bill No. 80. “There are two ways of doing it in so far as government officials are concerned: One way is to remove government officials from the coverage of 1405, while the other is to comply with the provisions of 1405 by requiring all public officials and employees to submit a waiver together with their SALN in favor of the Anti-Money Laundering Council (AMLC), the Bureau of Internal Revenue (BIR) and the Ombudsman to look into their deposits,” Escudero said. This way, he said, would not require changes to the law but would simply require public officials to submit a waiver together with his or her SALN. Since 2010, the veteran lawmaker has been submitting, together with his SALN, a written waiver on the secrecy of his bank deposits, which he files every year with the Office of the Ombudsman. In the case of private individuals, removal of bank confidentiality will apply under certain circumstances, the senator said. Escudero said that once amendments to the bank secrecy or the mandatory waiver for public officials is passed, bank records automatically become accessible to the AMLC, BIR, the Securities and Exchange Commission and the Ombudsman. “Now if they refuse to sign a waiver, then they don’t have a business being in government. Para sa akin, sino mang nasa gobyerno wala siyang karapatang sabihing sikreto yun,” he said. 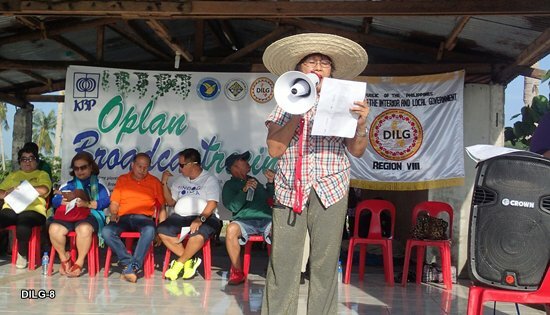 TACLOBAN CITY – About 600 participants from radio and TV stations, national agencies, schools, local officials, residents, civic and business groups joined the 2016 Oplan Broadcastreeing in Barangay Tanghas, Tolosa, Leyte on September 3, 2016. Participants planted 1,000 talisay trees provided by the Department of Environment and Natural Resources (DENR) which will serve as shoreline protection of this town facing the Pacific Ocean. OIC-Assistant Director Artemio Caneja of the Department of the Interior and Local Government (DILG) which spearheaded the activity together with the Kapisanan ng mga Brodkaster ng Pilipinas (KBP) Eastern Visayas Chapter, expressed hope that the plants would thrive with the support of the local government and residents. This is the second straight year that the tree planting was held in the same venue, based on recommendation by DENR after noting some plants had died due to the elements and being eaten by grazing animals. Among the groups that joined the tree planting were the Philippine National Police, Bureau of Fire Protection, local government of Tolosa, KBP member-stations DYVL Aksyon Radyo, i-FM, PRTV and DYDR Kaugop Radio, Bombo Radyo Tacloban; Perpetual Help Credit Cooperative; Eastern Visayas State University in Tacloban City; Visayas State University-Tolosa campus, Leyte Normal University, Rizal Central School, Tacloban City Central School, Delta Volunteer Fire Brigade, RADNET, Perpetual Help Credit Cooperative Incorporated (PHCCI), Philippine Red Cross, and Philippine Information Agency. Manila Bulletin and People’s Forum likewise joined the activity. The provincial government of Leyte, City Government of Tacloban and LNU lent vehicles for the transport of participants while LGU-Tolosa, Pepsi Cola, Quality Bread Bakeshop and Coca Cola Philippines donated drinks and food for all. Mayor Erwin Ocana of Tolosa, Leyte welcomed participants, while messages of support came from DILG OIC-Assistant Director Artemio Caneja and KBP-EV KBP-EV Chairperson Arwe K. Lam, as read by KBP-EV Auditor Hermie Songalia. Forester Wilfredo Lacambra of CENRO-Palo, Leyte oriented participants on the proper planting of talisay trees, while DENR and RADNET volunteers were paired to guide and monitor each delegation as they went about the tree planting in their designated areas. The event was likewise graced by the presence of DENR Assistant Regional Director Carlito Tuballa, DYVL Aksyon Radyo Manager Francisca “Babes” Custodio (past KBP-EV Chairperson and current KBP-EV Action Officer); Mr. Ian Goldfinch, a volunteer from the Australian government working with DILG on project management; Blanca Cercado, chief of the Local Government Capacity Development Division (LGCDD) of DILG-8; and Nilda Go, KBP-EV Secretary. Oplan Broadcastreeing is being held in line with the Memorandum of Agreement signed by the Department of the Interior and Local Government and the Kapisanan ng mga Brodkaster ng Pilipinas (KBP) in 2011 in support of the National Greening Program. Since then, Oplan Broadcastreeing activities regionwide have been able to plant 27,300 seedlings from 2011 to 2015. KBP member stations in Samar among others, conducted a similar tree planting under Oplan Broadcastreeing in Catbalogan City on September 3, 2016. PASAY CITY – Ahead of the historic first meeting between President Rodrigo Duterte and United States President Barack Obama, Senator Alan Peter Cayetano wrote an open letter appealing to the head of the world's biggest superpower to "give the Philippines and President Duterte a chance" to achieve genuine change, even as his government wages a three-pronged war to address poverty, defeat drugs and criminality, and achieve just and inclusive peace amid criticisms. In his open letter, the Senate Foreign Relations Committee Chair also appealed to President Obama to help the Philippines pursue an independent foreign policy that balances the country's relations with the US and China, even as he affirmed the country's firm commitment to the US as a long-time ally. "As a Citizen of the world and a believer in Change, allow me to write you an open letter to attempt to articulate the audacity of the Filipino people to hope for a better future and to aspire for a nation that is secure, peaceful, law abiding and prosperous," wrote Cayetano. "I write to you because more than any other person, you know how it feels to have the weight of the world on your shoulders...to have the burden of fixing the problems of your own country but having to constantly live up to the expectations of the entire world," he continued. The senator said that like President Obama, who persevered to overcome challenges and accomplish so much for the American people in the last 7 years, the Philippines now has a president who has shown willingness to sacrifice his life and honor to see that change comes to all Filipinos. "After decades of hopelessness and up to 10 million Filipinos leaving our country to find work in foreign lands and after an entire generation exposed to the perils of illegal drugs, we finally have a President who is trying to get the country back on the right track," Cayetano explained. "Now it is our turn. Our turn to experience Change we can believe in," he said, echoing the central theme of the presidential campaign that won Obama the US presidency. He then asked: "Will you now allow us to lose hope and fail? Will the West deny us the 'Change we can believe in?'" Cayetano noted that President Duterte has been misjudged by some sectors based on the way he speaks. This has been aggravated by a misinformation campaign about the human rights situation in the country, he added. "Does he (Pres. Duterte) not deserve to be judged on his record and his actions? On facts and not manipulated statistics? On where he wants to bring the country rather than his sometimes politically incorrect words?" he asked. On the two countries' relations, Cayetano stressed that the Philippines deserves a chance to assert its national identity and pursue an independent foreign policy. Explaining further, Cayetano defined this as "a foreign policy for Filipinos by Filipinos" which shall be marked by "a balanced friendship with our oldest ally and big brother the United States of America on one hand and a friendship of mutual respect with our neighbor China on the other." Cayetano expressed confidence that as President Obama has tried at every turn to avoid war and promote peace in various parts of the world, a win-win situation can also be worked out for the USA, Philippines and China. The senator then cautioned against efforts by pessimists, critics, and hardliners in the West, the United Nations, and within the country who want the US and the Philippines to continue to bicker and disagree. "Hardliners fear the Philippine government will make peace with the communist rebels. Critics fear that Christians and Muslims can't build communities and a nation together. Pessimists say that we can't be a drug-free country," he explained. "Will we let the pessimists and hardliners win Mr. President? Or will we persevere and try to understand each other, so we can wake up one day to a peaceful, prosperous and progressive Philippines?" "Can't we give the Philippines and President Duterte a Chance?" he concluded, even as expressed hope for a successful meeting between the two heads of state.